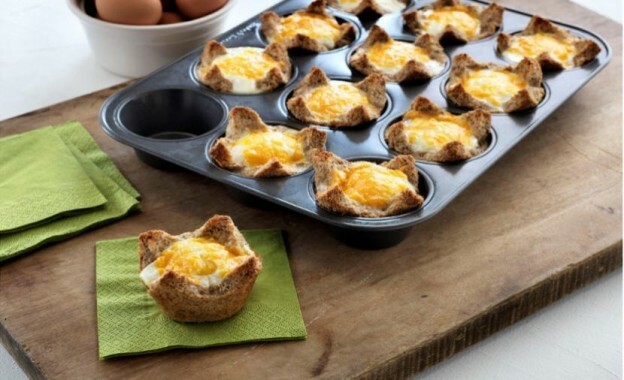 Eggs in a Maple Basket!! This recipe was sent to us from the folks at Golden Stage Inn in Proctorsville, VT. The Golden Stage Inn is a four season inn located in the Okemo Valley and just 5 minutes from Okemo Mountain Resort. Six servings (two baked eggs per serving). Optional: shredded or grated cheese for garnish. Grease 12 muffin cups. Combine butter and syrup. Set aside. Remove and discard crusts from bread. Gently roll each piece of bread flat with a rolling pin. Brush the maple butter onto both sides of each piece of bread. Tuck and shape a piece of bread into each muffin cup, pressing bread against sides, forming it to the shape of the muffin cup. Sprinkle with herbs and/or sea salt. Bake at 400 for 14-18 minutes until set. Note: the eggs will continue to cook as they rest; be careful not to overcook. Sprinkle some parmesan or grated cheddar on eggs and on plate for garnish. Can’t get enough maple syrup? Visit the Vermont Maple Festival – April 22-24, 2016 in St. Albans, VT. For more information go to the Vermont.com Calendar of Events. Thank you, Golden Stage Inn, for this great egg and maple syrup recipe! This entry was posted in Food, Now Trending on April 14, 2016 by Linda Cassella. Christmas Morning Breakfast Treats … Vermont Style Baked Acorn Squash w/Vermont Maple Syrup YUM! Maple Nut Twisted Biscuits Dinners Ready!